Multi-functionalized fluorinated arenes, especially those that are transformable fluorinated building blocks, are intriguing compounds in synthetic chemistry and for life science related applications. The development of straightforward and efficient approaches to these compounds is of significant importance and has, therefore, attracted much attention. 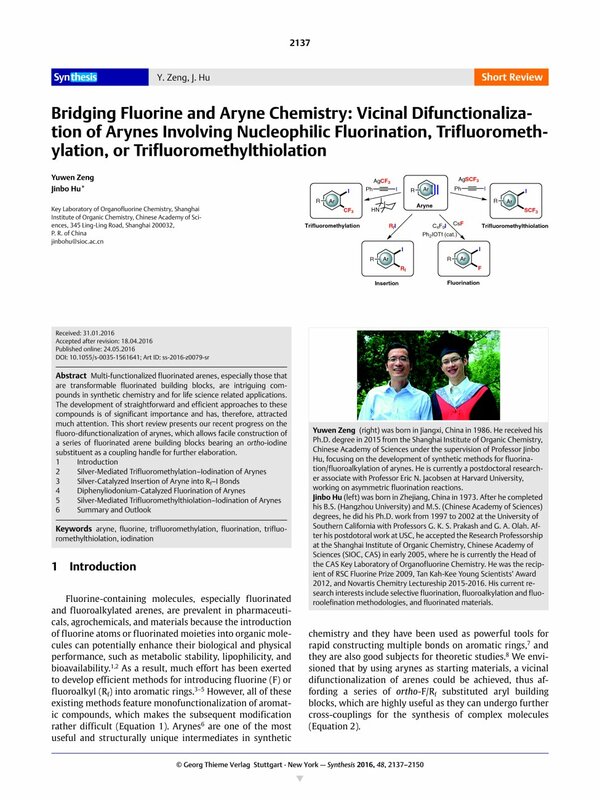 This short review presents our recent progress on the fluoro-difunctionalization of arynes, which allows facile construction of a series of fluorinated arene building blocks bearing an ortho-iodine substituent as a coupling handle for further elaboration. 24 Silver phenylacetylide is an insoluble off-white powder which was found in the reaction mixture after the reaction. 29 CF3I was dissolved and stored in a refrigerator with the exclusion of light. This stock solution is stable and could be readily diluted in situ to the desired concentration before use. 37 The nucleophilic attack of aryne from these anions was confirmed by observing corresponding byproducts in the reaction mxture. 44 Further analysis of this saturated solution by 19F NMR reveals that the ratio of F– to Ph2I+ is about 0.75:1. 51 For the monotrifluoromethylthiolation of arynes, see: refs 32a and 33b.